It’s that time of the year again, Winter!! And along with winter comes… You guessed it ice fishing season. It’s also time for an Eskimo Ice Auger Review. Like many of you anglers out there I hate it when I don’t have a quality auger to work with. It can turn a fun weekend of fishing into a nightmare. Trying constantly to tear through the ice with what seems like a dull butter knife. This constant forcing the auger to cut through uses a ton of fuel and also your own energy. By the time you get through the ice, you are too tired to fish. I know you might say why not get the blade sharpened? After so many times of sharpening and the cost to get that done, it’s just not worth it. Ice augers only last so long and as many ice holes I cut in a year it doesn’t take long. Especially if I’m using a cheap off brand of an auger. 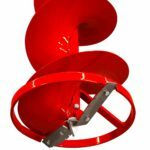 First off for the price you’re paying for this ice auger you are getting a darn good deal. At under $300 right out of the box, you can’t complain. The quality is impeccable compared to some of its competitors. The Sting Ray has all the features you would want in an ice auger. This thing is lightweight but tough and durable cutting thru 30″ of ice with no problem. It has a little trouble starting at around -20 Fahrenheit. It could depend on if your gas is old you will have a harder time starting the Sting Ray. To remedy that I make sure I have clean gas every time I go out ice fishing then it should start with not too many issues in the cold. If it’s that cold I either don’t go out ice fishing or I have my holes already drilled and I throw tip-ups in them. Then I just watch the tip-ups from my ice shack! I don’t mind the cold but not that cold. I must be getting old lol. Blades – This Eskimo ice auger comes Quantum blades that can be replaced if needed, These blades cut through ice like butter. They are strong and you can rely on them. Nothing worse than cheap crappy auger blades. Re-drilling holes are a snap with the center ring on this auger. Engine – The quantum blades are powered by great running 33cc 2 cycle Viper Engine that has starting power in very cold weather but like I said you will run into a little trouble starting it when you get to around -20 to -30 Fahrenheit. Having clean gas could fix this issue and is more than likely the cause of it not wanting to start in these temperatures. They use sealed ball bearings in their transmission, not bushings! 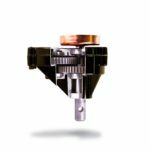 Eskimo is the only auger company using sealed ball bearings in their transmissions! Mitten-grip recoil – so that you can start the engines with your gloves. Primer Button makes it easy to start. Handles – The foam grip handlebars provide for less vibration and angle upwards for better control. Blade Protector – Comes with a protective hard plastic cover that adjusts with a rubber strap. 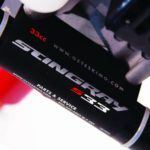 The Eskimo Sting Ray 33cc w/ 8” Quantum Gas Auger only weighs 28lbs. It’s easy to haul around and carry around when you have a ton of holes to cut. You will be having people around wanting you to drill their holes for them because they see how quick and easy your auger is cutting. This has a 2 stroke motor and uses a 50:1 gasoline to oil ratio. Dimensions of the product are 50″ high x 50″ long x 22″ wide. Nice compact but tough ice auger. This ice auger also comes with a 5-year warranty. I don’t know the specifics of the warranty to you would want to check that out for yourself. In this Eskimo Ice Auger Review, I have shown you all the features and specifics that this ice auger has to offer. In my opinion, this is an excellent ice auger. It’s tough and durable and at only 28lbs it’s lightweight and easy to carry around and maneuver. Quiet running compared to many augers out there. The blades on this thing are sharp right out of the box. They are strong and reliable. With a center ring that keeps the blade from skipping around on the ice and making re-drilling holes easy as pie. A 33cc 2 stroke Viper engines with sealed ball bearings in the transmission. And starts in cold weather with only 2 or 3 pulls! The only con to the Eskimo Sting Ray 33cc w/ 8” Quantum Gas Auger that I could see is the trouble starting at -20 to -30 Fahrenheit. I heard that from only one person so I think if you have fresh gas in it and have mixed the gas to oil ratio right this shouldn’t be a problem. The price is right at only $309.99 and shipping is free if you have an Amazon Prime account! A 5-year Warranty is in itself a top feature of the auger. I hope you got some useful information out of this Eskimo Ice Auger Review. If you have questions about this product or about anything that has to do with fishing please leave a comment below and I will answer your questions the best I can. You have great advice there for the cold season. I saw myself swearing at my old Ice auger last winter, and from what you write in your article, it probably was caused by old gas. I got so mad at it that I sold it and now I am in the market for a new one. I live in Canada and our winters are soooo long that we have to find ourselves something interesting to do during those long winter months. I find that ice fishing is just as relaxing as regular fishing, minus the warm weather of the summer. Now I looked at the Eskimo ice auger, and from what you say in your article, I won’t have the astle of wearing myself down BEFORE I start to fish (and it should start). I clicked on the link from amazon and changed it over to the Canadian version, and although this one seems one of the best out there, I find the Canadian price a bit stiff at $434. What a difference in price from one country to the next! 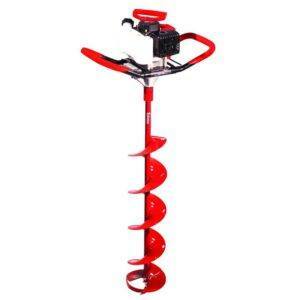 Did you review any other augers beside the Eskimo, or do you recommend one a little cheaper? There is another brand that is similar to the Eskimo sting ray and is a little cheaper. Price in US DOLLARS IS $226.57 and 303.41 in Canadian. That’s a big difference why don’t you try checking that one out. Hope this helps. 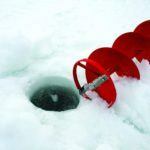 I’m looking for a new ice auger as my current one has giving me a lot of problems last year. I won’t mention the brand, but mine has been having problems with fuel leaking and I even send it back to be fixed, only to have it leak fuel again on the 3rd use after being repaired. By reading your review, it’s clear that you like this product, so I’m gonna check this one out. Hopefully this brings me a relaxing ice fishing experience this winter. Cory, thank you for taking the time to review this auger. I am seriously considering it as a gift for one of my family members. I was pleasantly surprised to see that it weighed only 28 lbs. I don’t want my brother-in-law to think I’m a complete idiot by asking this question, but as a Texas girl that has never gone ice fishing I am curious. Do very many people actually go ice fishing when it is -20 to – 30 degrees out? Personally, I don’t want to be fishing when it is 60 degrees outside. In other words, I am trying to figure out if the potential problem of it starting at super low temperatures would even be an issue. Thanks in advance. Here in Wisconsin people do go out fishing in those cold temperatures. The issue with the ignition not working is not really an issue in my view because like I said in the article I only heard that from one person who used it in -20 temps and I have a feeling that person probably had old gas in the auger would cause starting issues when it’s that cold. But if you bring along fresh gas and keep it out of the wind in them temps it should start just fine. Hope this helped. 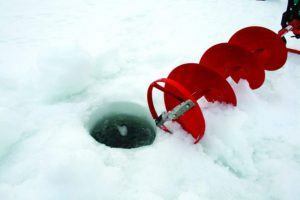 Your brother – in – law would love the Sting Ray Ice Auger from Eskimo. Thanks Cory. It sounded pretty good based on what you said in the review. If I get him that for Christmas, he and my sister will have to take me ice fishing at least once. But not when it is 30 below.